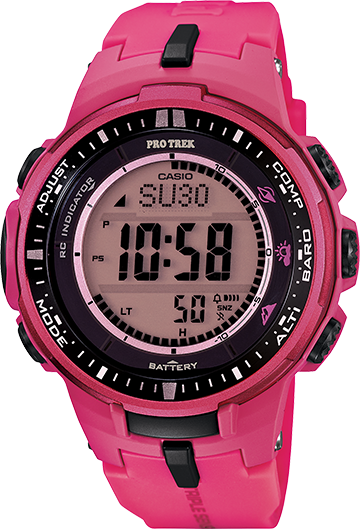 This new addition to the PRO TREK lineup incorporates Triple Sensor Version 3 and advanced CASIO original technology that makes it possible to pack sensors that are 95% smaller than those of previous model. Despite their smaller size, the new sensors in these models deliver higher reading accuracy and improved energy efficiency. Large side buttons and one-press access to digital compass, barometric pressure and altitude, and temperature readings keep important information at your fingertips. Other features include MULTIBAND 6, Tough Solar, 100-meter water resistance, and more. Everything about these models is designed and engineered to make them essential pieces of outdoor gear.